German is 6 Years Old - I Can't Believe it! German had a 'Sports' Party on Saturday with about 20 kids! It was a great day to be outside and play games. We played baseball and sharks & minnows. The kids really liked playing with the football flags. Thanks to all of German's friends for coming and playing and spoiling him with fun gifts. I never could get a birthday photo of just German, Scotty kept wanting to be with him - such good brothers! I love how serious they all are about this present- especially Scotland! We've been enjoying the nice weather and going on some hikes around the valley. We first went to Papago Park and climbed all over those "mountains". The next weekend we went with our friends and hiked Camelback Mountain. Word of advice: if you start hiking a mountain and realize that you are the only one on the mountain with children, especially the only one with a baby in a pouch, you're probably in over your head! It was fun and if that darn sun hadn't started setting we would have gotten to the top! This guy kills me! There we are on this rock, enjoying the view, when Eli pulls out his goggles and puts them on. German asked him why he brought them and he told us it was to protect his eyes from the sun. Needless to say, the boys packed their own bags. On the Camelback hike Eli brought a motorcycle toy. We find the most random things in his pockets - I'm pretty sure he'll be the one to bring home a frog or something! This was our first year not traveling for the holidays. We have missed our family of course, but it has been really nice not to have to pack everything up and live out of a suitcase - the nicest part has been that we didn't have to go out and buy winter gear! We started the holiday out with a new camera. This picture of Marshall would never have been so crisp and timed so right with our old camera! slowly and taking pictures or doing double takes! We made a lot of new friends in our neighborhood. Getting ready to open our Christmas Eve pjs. Poor Marshall was blocked in the photo, but doesn't the fire and stockings make it feel like maybe we were in Vermont or somewhere very cold?! I love these ties!!! My boys wore them every Sunday since Thanksgiving, and I waited until Christmas morning to finally take a picture - not my brightest idea, all they wanted was candy and more presents, not some lame picture! But they sure were cute all matching. By the way, the key to cute Christmas ties is to either make them yourself or buy them at Children's Place in October when you first see them, because they go quick! Cute Marshall playing in his Christmas present. The boys received a lot of Legos (and Duplos) for Christmas. My 12-layer jell-o. Probably the most culinary thing I've done in a long time! Go Me! Updates to follow, one of these days! This is us in front of an old steam engine that came through Gilbert last week. Scottie is definitely an individual with his own agenda in life! We love this two year old! One of the best things about a two year old is their sweet speech. This kid comes up with some of the best lines. We were all taking turns discussing our favorite Thanksgiving foods when Scotland piped up with, "My turn, my turn. Hot Dogs!" I don't recall ever having had hot dogs for the best feast of the year, but whatever! While reading a Thanksgiving book about pilgrims and Indians, Scotland pointed to "dat neked boy." He continued to point out each 'naked boy' in the book. There's a picture at church of Jesus breaking a round piece of bread. Scotland looked at it and said, "Jesus eat pancakes!" He's two months old already! I can't believe it. As I mentioned in a previous post (Scroll down for lots of updates), Marshall is a perfect baby! He's now 9 weeks old and about two weeks ago he started sleeping through the night - that right there is awesome, but he's also super flexible with our schedule, loves to be held, but also loves to just be by himself in the swing. He even graciously puts up with all of the many hands and faces that frequently get up in his business! And my favorite part about him is his laugh! I love it! I love this guy! I tried to convince him not to go and leave me, but he would not be convinced. Eli is a bundle of personality. His teacher asked what were his hobbies and all I could think of was: PLAY. He loves to play. Animals, trains, cars, good/bad guys, kitchen, legos, sports, pretty much anything. I have often found him sitting at the table pretending his fingers were different action heroes. It doesn't take much to get his imagination going. He loves his brothers, but has a special attachment to this little Marshall. 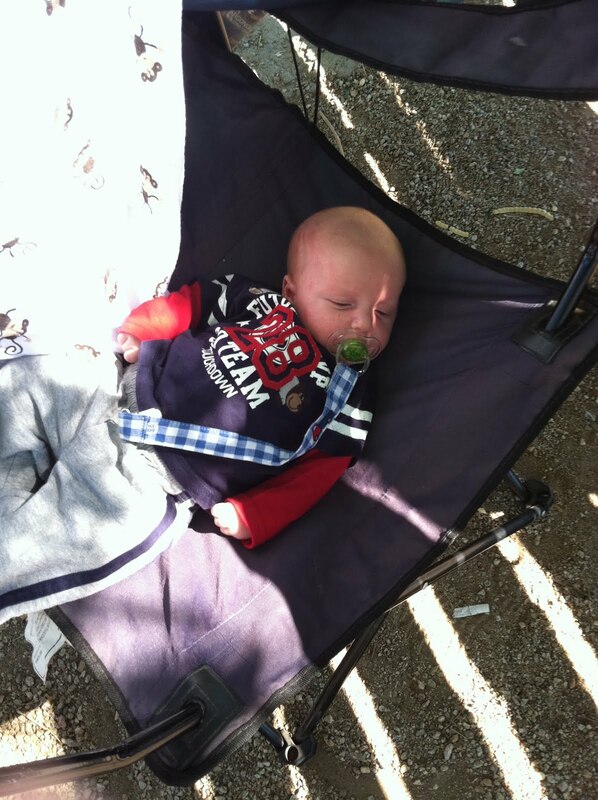 Eli is the first one on the scene whenever M cries or needs his pacifier. He often lets me know what M's needs are: food, diaper change, etc. Eli gives this baby more kisses than anyone in the family, which is a lot! He's a very creative person and tells good jokes, I know I will miss him while he's gone, just like I do G-man. Why do they grow up way too fast?! About a week before our trip Joshua was playing basketball and after a lay-up felt a huge shortness of breath and a lot of pain on his left side. I finally convinced him to take a motrin the next day, which seemed to help, so he just dealt with the pain assuming that it would heal eventually. After our trip (after he walked all over San Diego) he had a doctor's appointment where the x-ray revealed that he had a collapsed lung! So he spent 4+ days in the hospital with a tube in his chest. It was a crazy 4 days and many thanks to everyone who helped with the boys so I could spend a couple of hours each day with Joshua. Joshua is doing just fine and even played basketball last week - proof that nothing, not even a collapsed lung, can keep this man from playing ball! We decided to take advantage of German's Fall Break and make a long weekend trip to San Diego. The boys are still playing 'navy guys' after our tour of the USS Midway, which I highly recommend to anyone visiting San Diego, although a pedicab driver tried to convince us that our kids would be bored to tears! We loved SeaWorld! Our boys are really into animals, so it was fun to see so many that you can only read about. I think "Shamu" (of course) and the sharks were the most impressive, but the penguins, otter, and dolphins were a close second. We also enjoyed a pleasant afternoon collecting seashells at the beach. The boys enjoying dinner on the hotel floor while watching football. Waiting for the dolphin show. Side note: probably not a great idea to sit in the 'wet zone' with a 5 week old baby! We toured an old merchant/passenger ship where the boys dressed up like immigrants - I love Eli's face! Can you imagine living in such tight quarters? I think I would like to have been the admiral - his quarters were cush! 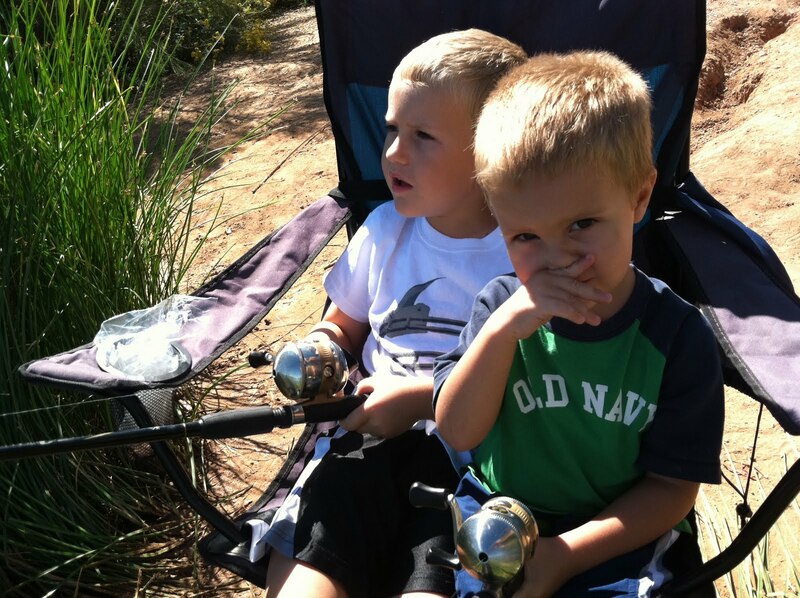 Our town offered a morning of family fishing in which they provided all of the poles, tackle, and bait and no licenses were needed. 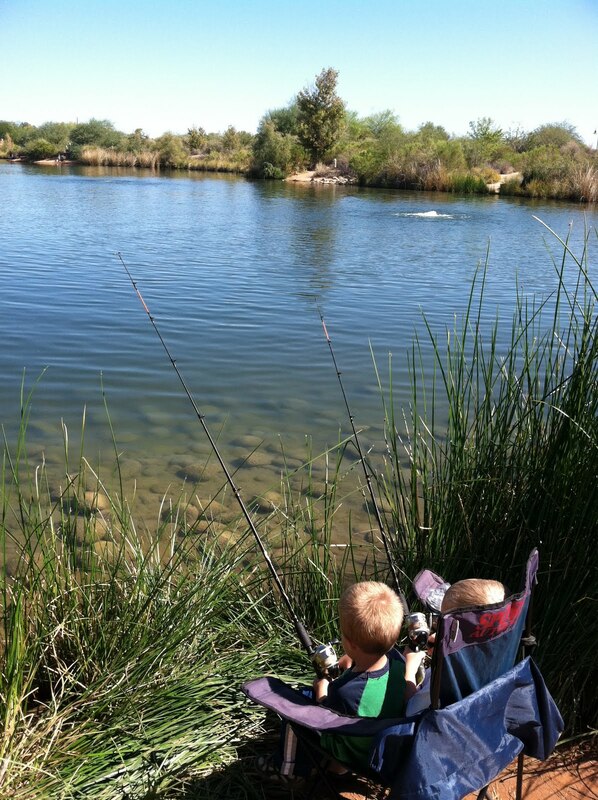 Joshua's been trying to find a way to take the boys fishing, but it just hasn't worked out yet and this was the perfect opportunity. By the time we got there the 'lake' was pretty much out of stock of fish. The boys were bummed, but all the more excited for their next adventure. You might wonder where Scotland was. Just after I took the first pictures of Marshall we decided it would be best for me and Scotie to go exploring away from the water and wait another year for his fishing explorations to begin. Apparently, the thought of eating a soggy Cheez-it after dipping it into the nasty water wasn't disgusting to him (Joshua stopped him just in time) and he kept insisting upon taking his shoes off! We love this guy, he sure keeps us on our toes! 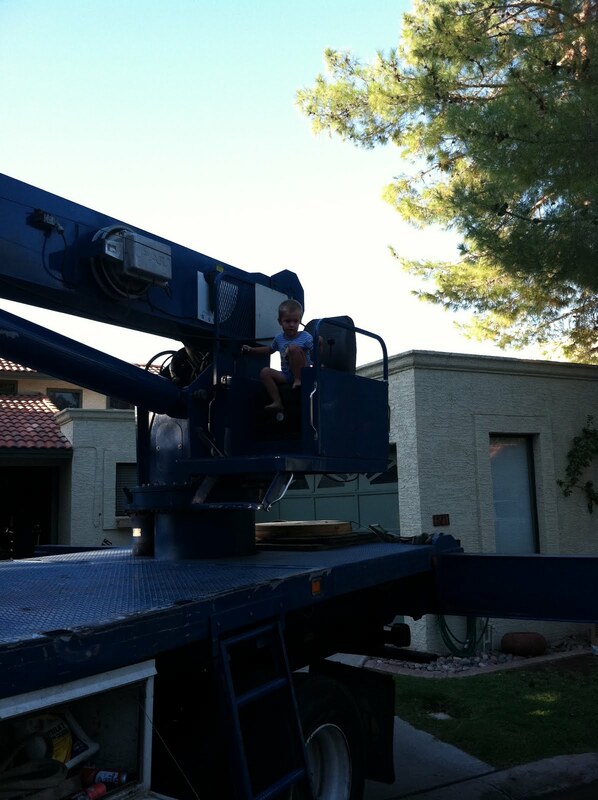 Our neighbor came over really early a couple of weeks ago and asked if the boys wanted to see the crane that was putting a new A/C unit on their roof. Of course they all ran outside! As we were standing there watching, the crane driver asked German if he wanted to guide the crane. 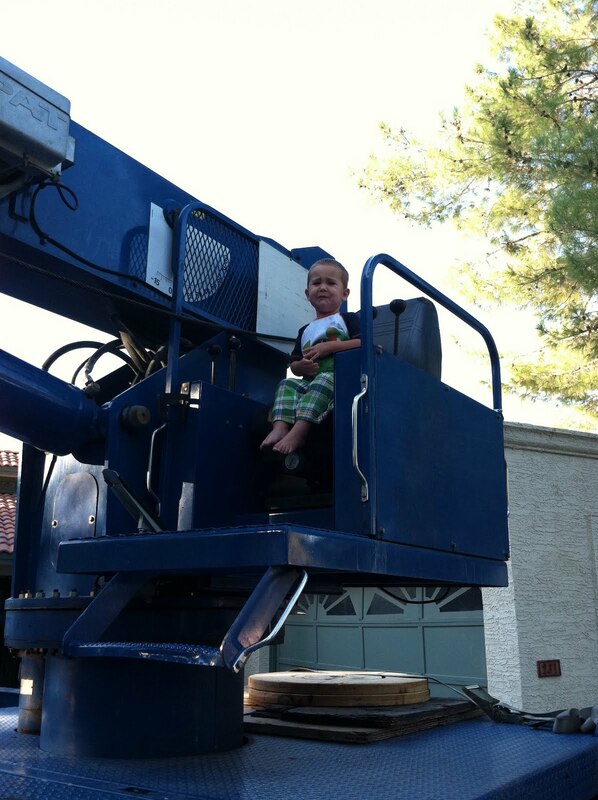 G-man jumped up there and the man told him which levers and pedals to push. 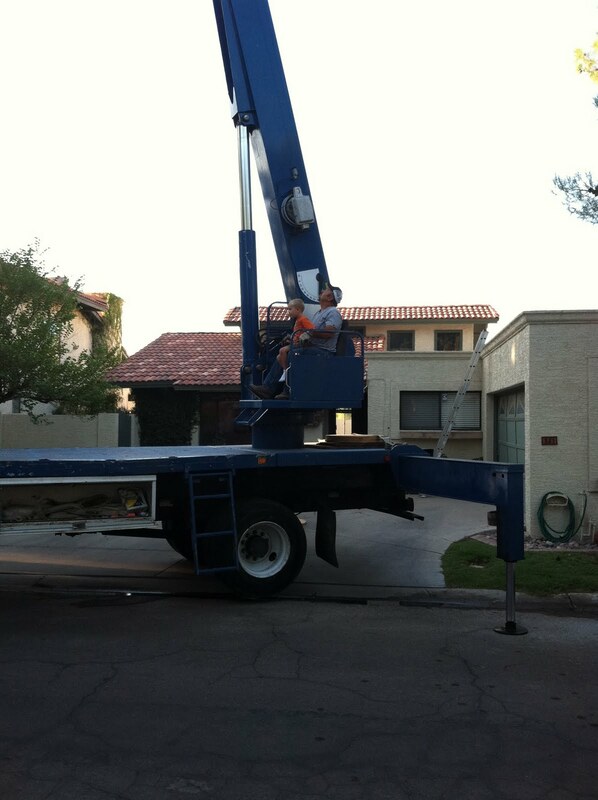 At first the man helped him a bit, but then he got out of the seat and German maneuvered the crane by himself! It was awesome - he was helping the guy for like 20 minutes! We felt this was a good excuse for him to be late for school. Eli also wanted to try, so he took a stab at it. Scotland wasn't as excited to be so high up! We've been enjoying our easy-going Saturdays of late: we start out with one of German's football games, then we do any necessary jobs, and then we top it off with family fun like swimming, bike riding, fort building, and of course college football.